The subheading on the blog is ‘Music from Scotland and a bit further afield’, but I realised I have only been concentrating on music from the motherland. 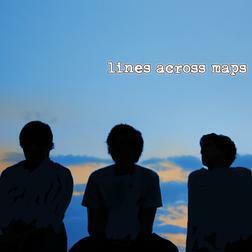 Lines Across Maps frenetic brand of math rock ticks all the right sort of boxes for me. There is a lot going on in each track, with a myriad of tempo changes and guitar postures that keep things constantly evolving. It never loses direction though, and feels akin to an impressionist painting where all the small parts make sense when the whole piece is presented and they can be taken in together. The vocals are delivered in a Lincolnshire accent, and while it is often hard to feel an affinity to an accent other than your own, it really works for me due to the punchy delivery and knack for catchy little lines that stick in your head. Lines Across Maps are an extremely young outfit, so the potential levels are high; they have already been on BBC Introducing, can count This Town Needs Guns as fans, and have released their debut EP, which is a FREE download on Bandcamp.